Can you believe we are now less than a month away from Fourth of July? Yup, take a peek at a calendar if you dare. June is always half over. Wasn’t it just Easter or something? The days seem to go by at warp speed. 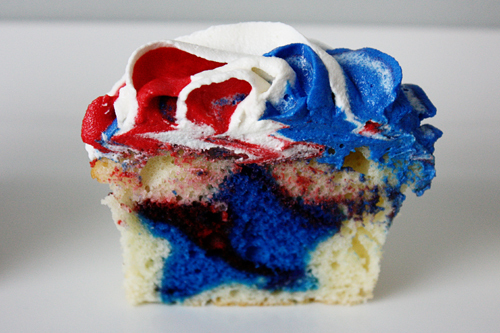 These cupcakes from Not Your Momma’s Cookie will take a bit of time but won’t everyone be impressed when they find a red and blue star in the middle of their cupcake? If you’re a bit OCD, then this is the recipe for you! Just kidding, sort of. 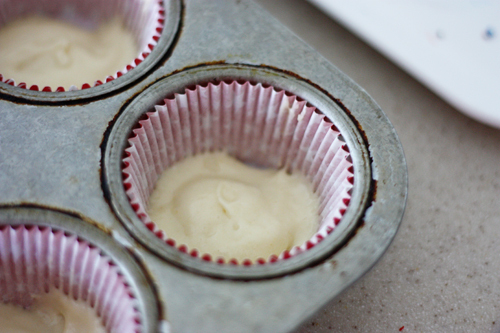 The trick is to line up the star “inserts” in the same direction and then remember to remove the cupcakes from muffin pan so that the cupcakes all face the same direction. Or not, it’s up to you. 16 ounces preferred frosting – as long as it is white/off-white! 1. Prepare the cake mix according to the directions. Divide the batter in half. 2. Take one half of the batter and divide it onto two equal amounts (you can use a food scale, but you should be able to eyeball it). Dye one bowl red and one bowl blue. 3. Grease an 8×8 pan (round or square). 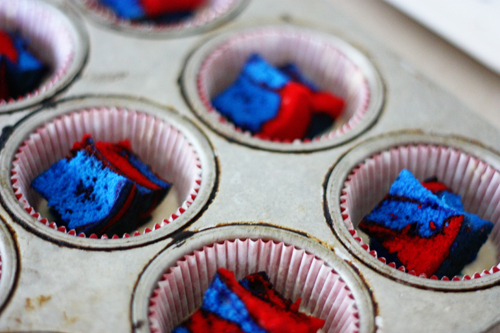 Drop dollaps of blue and red batter into the pan. 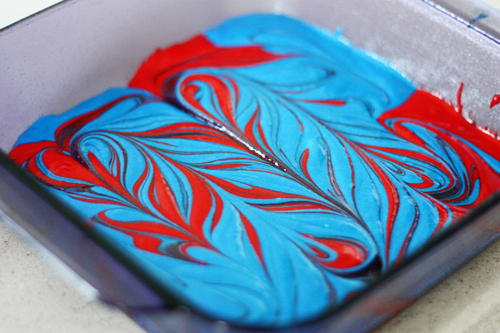 Swirl colors together with a knife. 4. Bake according to the package directions (there should be instructions for baking an 8×8 cake). 5. Once the 8×8 cake is baked and cool, release the cake onto a cutting board. Repeat until you have 10-12 stars. Your mileage may vary, depending on the size of your star cutter. 6. Now, we’re ready to whip up some cupcakes! 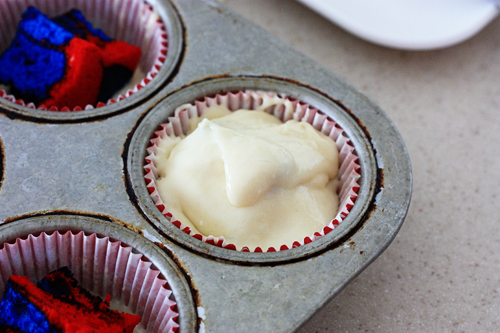 Line a muffin pan with paper liners (patriotic ones, if you have them!). Put a little bit of the reserved white cake batter in the bottom of each liner. Take one of your cake stars and gently place it into the liner. It is very important that you make sure all of the stars are facing the same direction! This will be very helpful later. 7. Bake according to your package’s directions. Let cool for a minute in the pan, then transfer them to a wire rack. Again, make sure that all of the stars are still facing the same way! Since you won’t be able to see the stars anymore, you have to remove them from the pan in the same pattern. The easiest way to do this is pick up and place one cupcake at a time onto the wire rack. Once they are completely cool, you may want to draw a dot with a food writer on the cupcake liner so that you know where to cut the cupcake so that the star is visible. If you cut at the wrong angle, it’ll just be a weird red/blue blob. A delicious blob, but a blob nonetheless! 8. 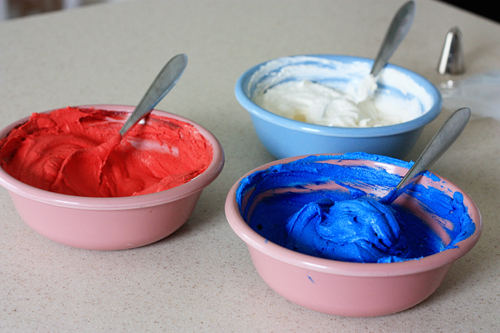 To make the tie dye frosting, divide up your frosting equally into three bowls. 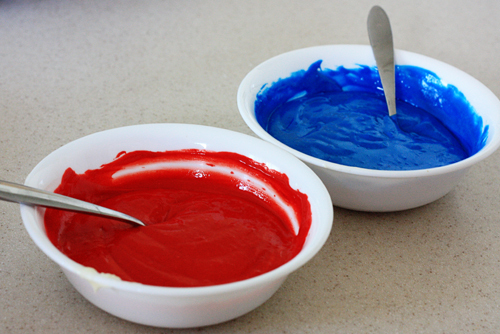 Dye each bowl red, white, and blue. 9. Place each color in its own pastry bag. Snip off the tip of each bag (you want a small to medium sized opening). 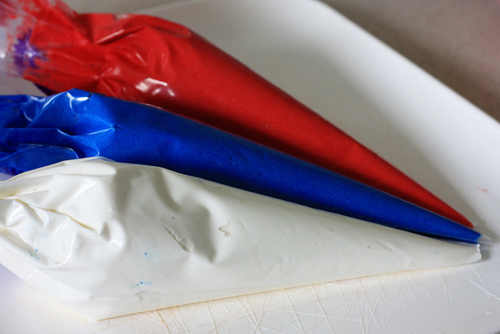 For example, if the bag with the white icing was higher up than the other two bags, then the icing would not equally pipe the three colors. Make sense? 11. Now that you have all three bags into one bag, squeeze out a little bit of frosting onto a paper towel or cutting board. It may take a couple of squeezes until you start seeing all three colors. 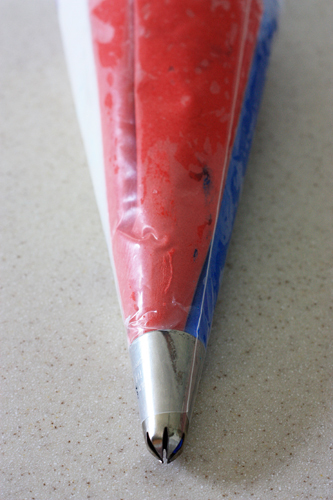 Once you see red, white, AND blue, you’re all set! 12. Frost each cupcake. Admire them for a second before cutting one open to see that pretty star.